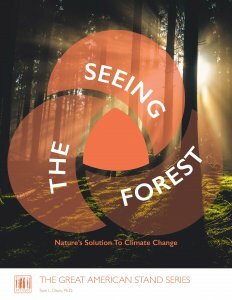 Natural forests are the most efficient climate-stabilizing technology we have. When left standing, natural forests can pull vast amounts of carbon out of the atmosphere, storing it in plants and soil. They’re also the best natural defense against the impacts of extreme weather events, providing flood control and stabilizing fresh water supplies. 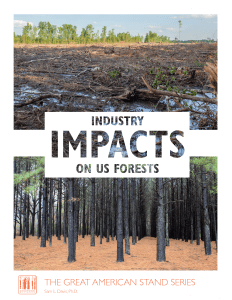 Forest protection in the US, though, is not seen as a climate priority even though our country is the largest producer and consumer of wood products. Logging rates in the Southeast are four times as great as South American rainforests. Instead, government and industry often promote increased logging as a climate solution. Now is the time for change. 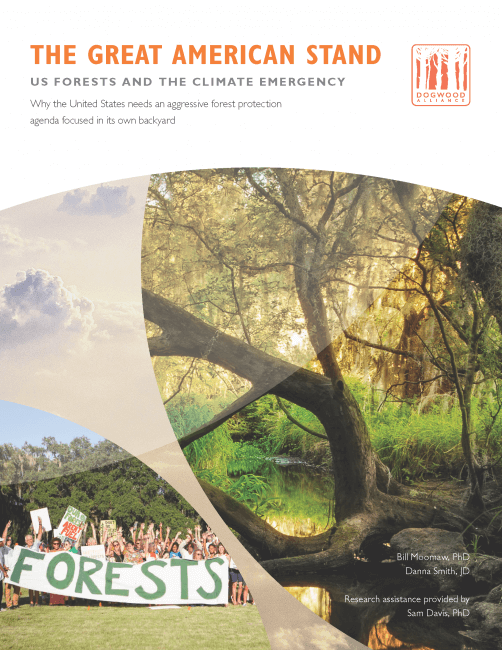 Renowned climate scientist, Dr. William Moomaw, and Dogwood Alliance’s Executive Director, Danna Smith, have co-authored a groundbreaking report “The Great American Stand: US Forests & The Climate Emergency”. The report identifies the need for forest protection to be an urgent, national priority in the fight against climate change and as a safety net for communities against extreme weather events caused by a changing climate. Watch Dogwood’s own Danna Smith present at TedXAsheville. The report calls for a new wave of policies that recognize the indispensable benefits of standing forests, while demonstrating that greater protection and restoration of forests can create new economic opportunities for rural landowners and communities. especially if the world unites for a common vision of keeping climate change at just 1.5 degrees Celsius. 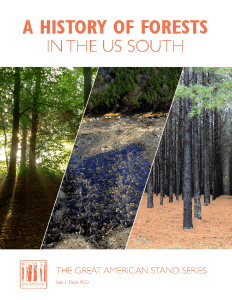 A History of Forests in the US South charts the legacy of forest destruction in the US South. Our Southern forests are some of the most biodiverse in the world. They provide aesthetics, tourism, recreation, water filtration, waste treatment, regional climate regulation, and protection from extreme events. Yet we are rapidly degrading and losing our natural Southern forests, putting untold species and benefits at risk. How did we get here? In the 1600s, there were over a billion acres of forest in the continental United States, with roughly a third of those acres in the US South. Colonization and settlement, followed by rapid extraction of natural resources, destroyed over a hundred million acres of forests in the US South in less than 100 years. In essence, we were overdrawing our carbon account and emitting carbon into the atmosphere instead of storing it in our forests. The movement has begun, but we need new policies to keep our forests standing now. You can help. Take a stand for American forests!